There's no more surefire way to rekindle a sense of adventure than to serve as the faithful sidekick to a happy dog, for whom curiosity is second nature. Just ask Idris Martin. 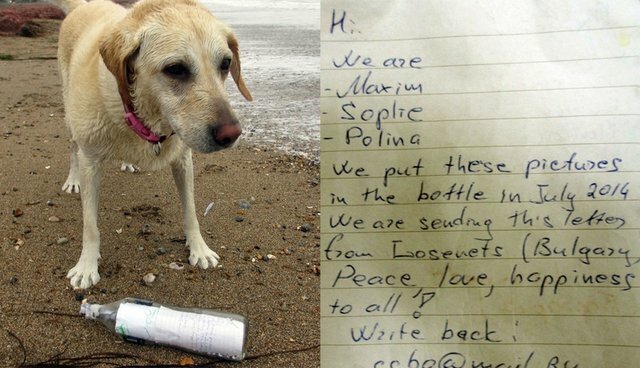 Martin and his rescue dog Sheba were out enjoying a day of fetch at the beach near their home in Weymouth, England, this week when the pup happened upon a magical discovery - one which she was uniquely equipped to find. "Sheba won't go for balls or sticks, but if you get an empty water bottle, put a little sand and water in it and throw it out, she'll bring it back every time," Martin told The Dodo. "Well, on Monday, we were walking along the beach and I threw a bottle into the ocean for her, but I saw her grab something else. 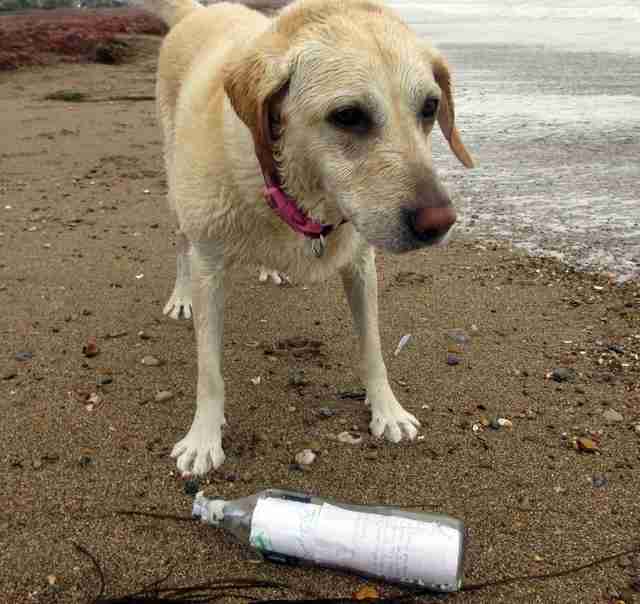 She couldn't really get a grip on it to bring it back, so I waded out to my knees in the water and saw that it was a glass bottle with a note in it." After taking the new treasure home, Martin soon learned just what a remarkable journey the bottle must have had before Sheba finally discovered it in the ocean that day. 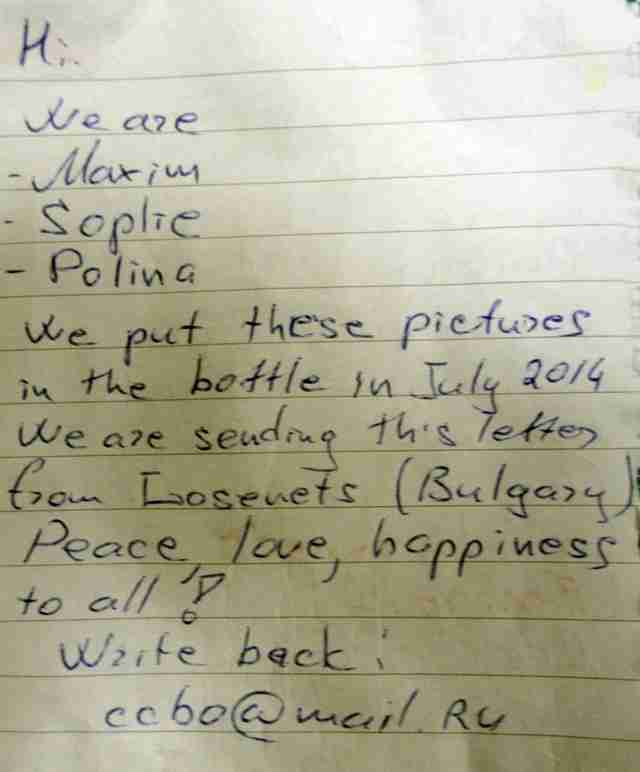 According to the message inside, which was written by three young children, the bottle was tossed into the water 14 months earlier in the coastal town of Lozenets, Bulgaria. 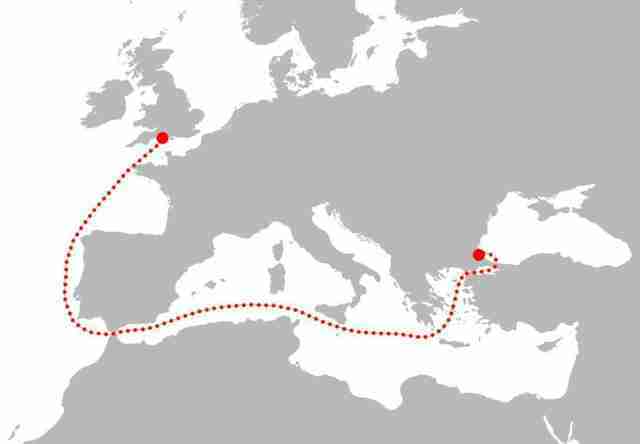 To reach the place where Sheba plucked it from the coast in England, the bottle and note had to travel from the Black Sea, through the Bosporus Strait, along the Sea of Marmara, through the Dardanelles Strait, into the Aegean Sea, clear across the Mediterranean, out of the Strait of Gibraltar, up into the Atlantic Ocean and across the English Channel before settling on the southern shore of Britain - a journey of more than 3,500 miles. 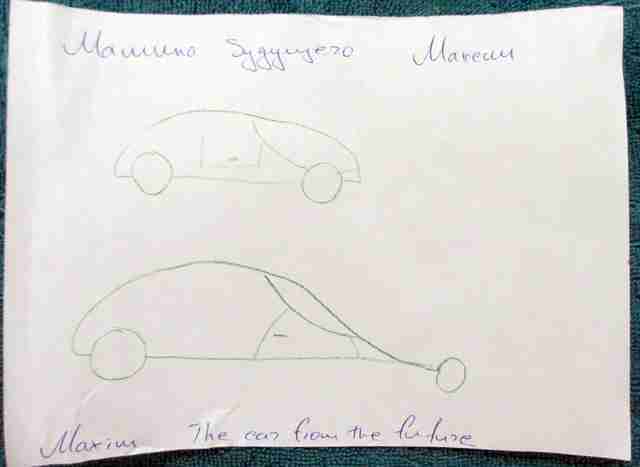 Included with the note were drawings the kids had made. From Maxim, "The car from the future." 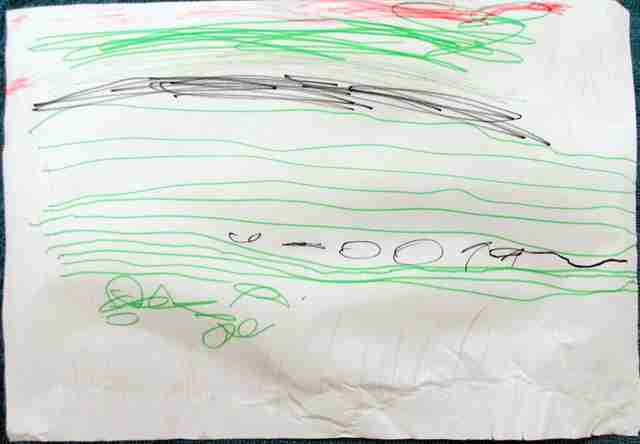 From Polina, "This is sky, grass and funny man!" 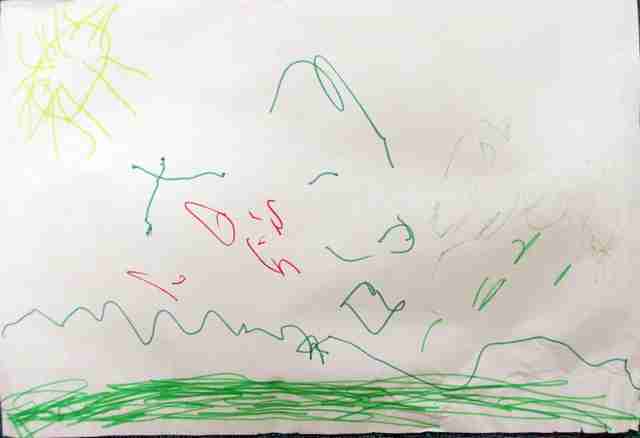 And this one from Sophie, captioned with the word "Congratulations!" 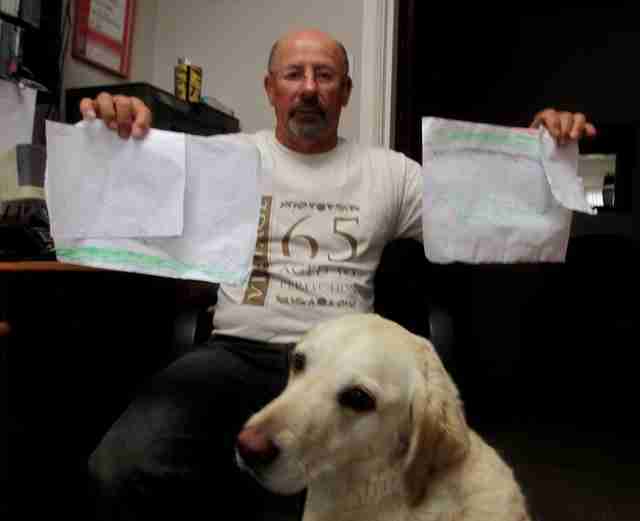 Martin, who is delighted by what his dog found, told The Dodo that he's sent an email to the children, per their request, to inform them that their message has been received, and he's eagerly awaiting their reply. He admits that had it not been for Sheba's love of bottles, they might not have been the ones to find it, but he's grateful they were. "To think about how far it came is truly amazing," says Martin.